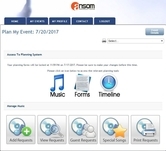 Ansom Productions providing Ceremony sound, Cocktail and Reception entertainment. Ansom Productions providing DJ entertainment, Emcee services and lighting. Ansom Productions had the opportunity to provide Modern DJ, Lighting and Photobooth for Katie & Todd's elegant wedding on Coronado Island. DJ - ANSOM Productions, Inc.
Ansom Productions providing DJ & Photobooth for a modern and fun couple overlooking the beach at Cape Rey Hilton in Carlsbad, CA. Ansom Productions had the opportunity to rock this beautiful couple's wedding providing DJ, Lighting & Modern Photobooth. DJ & Photobooth: ANSOM Productions, Inc.
Bill & Michaela's Scripps Seaside Wedding in La Jolla, CA. Ansom Productions providing DJ, Uplighting & Photobooth. Esther & Steven's ranch wedding in Temecula California. What a great intimate setting at Longshadow Ranch. Click "read more" below for Vendor information.